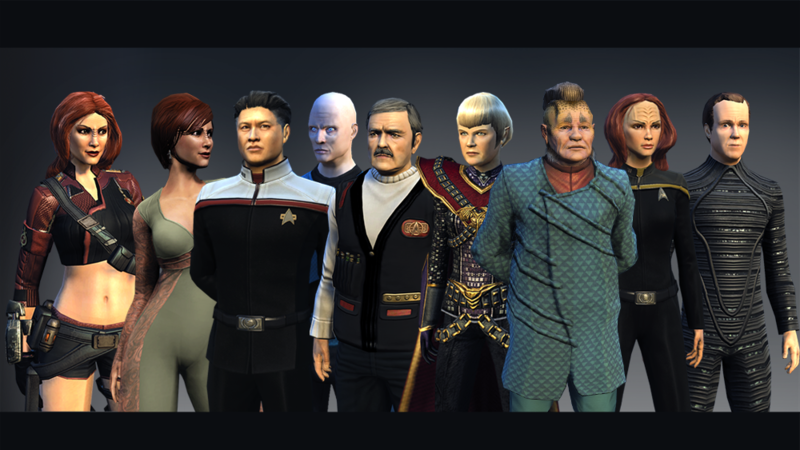 Star Trek Online features a lot of voice talent throughout the many episodes and content found in the game. We’ve been honored to include the talent of a number of Star Trek alumni from all eras, film and television, past and present! From the Original Series, Leonard Nimoy and Walter Koenig reprised their iconic roles, bringing Spock and Chekov to the game. Michael Dorn and Denise Crosby beamed in from TNG, adding the voices of Worf, Tasha Yar, and Empress Sela to several featured episodes. Chase Masterson and Aron Eisenberg came to us from Deep Space Nine to reprise their roles as Leeta and Nog. From Voyager, we have the talents of Tim Russ, Robert Picardo, Jeri Ryan, Ethan Phillips, Garrett Wang, Robert Duncan McNeill, Kim Rhodes, and Lisa LoCicero. Kipleigh Brown and Matt Winston from Enterprise recently joined the roster. The legacy of James Doohan was represented by his son Chris, reprising his father’s role as Scotty. And Zachary Quinto and Joseph Gatt from the new Star Trek film franchise have joined the ranks of esteemed Trek alumni in the game! All in all, there are a lot of familiar faces (and voices!) from the Star Trek universe to experience within the game. You never know who you might meet there next!